The planet's Great Red Spot is quickly shrinking, and scientists have discovered some odd realities about this epic storm. 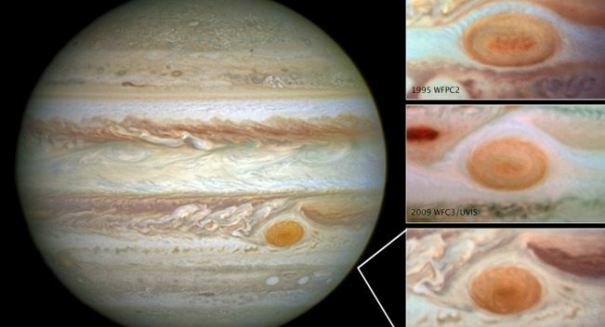 As we reported recently, the Great Red Spot that has become iconic on the surface of Jupiter is quickly shrinking. But an astonishing new discovery by scientists thanks to data and imagery from NASA’s Juno spacecraft suggests we may have much more to learn about this gas giant, and it could help us better understand planet formation in our solar system. Scientists believe that this gigantic storm, which is so big that it could fit the entire Earth inside of it, is shrinking at a pace that would cause it to disappear within our lifetimes. And now it appears the shape of the storm is changing as well, growing taller into the atmosphere and even changing from its trademark red color to an organish hue. Scientists think this is happening because of the fact that the gasses fromt he storm are getting pushed higher up in the atmosphere and are interacting with ultraviolet radiation that is being put out by our sun. This extraordinary development will be monitored by Juno and will provide scientists with greater insights on this gas giant.